Though the play may be entitled James III, the reality is that this slice of the Stewart monarchy was indubitably shared with his wife Margaret of Denmark. The third king of his name was a capricious fellow indeed, the self-confessed “sparkle before the dark”, a rebellious dandy concerned far more with the trappings of monarchy than the minutiae of ruling, most amusingly evidenced by his procurement of a choir to accompany him at all times. By contrast, his pragmatic wife (“from a rational nation with reasonable people” lest you forget!) looks after the treasury, pets the furrowed brow of the privy council and generally rules the roost. Of course she does, she’s Sarah Lund! 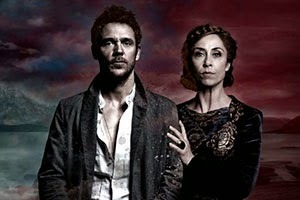 What is truly remarkable about Sofie Gråbøl’s performance though is that you’d hardly know it. She’s a hugely attractive stage presence, warm and funny as an initially tolerant spouse but growing beautifully in stature as she seizes matters into her own hands. The play’s best scene comes with the gift of a new-fangled gift from Venice called a ‘mirror’, granting most everyone who looks in it the first ever glimpse of themselves and her reaction to her reflection is just gorgeous to behold, the kind of scene that budding actresses should have in their back pocket for auditions. With Blythe Duff’s dowager Princess Annabella and Rona Morison’s sparky Phemy in generous support, the Queen’s court is a vibrant place to be. That said, Jamie Sives makes James III enjoyably brattish, especially when in the midst of his adoring coterie – tasting wine with Andrew Rothney’s Cochrane is wittily done, taking advantage of Mark Rowley’s Ramsey adds a real frisson. Munro ensures that the recurring theme of what power does to a man is engagingly and differently explored and appropriately for the end of the epic sweep of the trilogy, the final notes resonate strongly with the debates that have dominated Scotland in recent months. Seeing all three plays on the same day was a real pleasure, a scandalous luxury to be sure (especially midweek) but a genuinely theatrical event of which I was glad to have been a little part. Being able to draw the narrative lines through nearly a century’s worth of history and get that sense of continuity of character really added to the experience, plus seeing a company working so hard and so creatively together has its own special thrill. Individual performance awards would probably go to James McArdle, Jamie Sives and Sofie Gråbøl but taking the wider view, Blythe Duff and Mark Rowley won the day for me with their always excellent work across all three. Hugely, highly recommended, dayseat all three if you have to. This is theatre that really captures the moment and as we hear late on “Scotland will do what Scotland does”, one can only hope that no matter what the future holds, the National Theatre of Scotland continues to make work as epic and audacious as this.